Yale Wireless Smart Home & View Alarm Kit SR-330 - £299. SPAR Earl Grey 50 Bags - £1.50. Lucozade Sport 4x500ml - £2. SPAR Milk Chocolate Stick 3x100ml - £1. Offer available to 25th June. Selected Pampers Nappies 3 for £12. Terma Tune Vertical Radiator Metallic Black Textured, (H)1800 mm (W)490 mm - £270 £190. Offer ends Monday 16th January. 65L Box & Lid - 2 for £10. 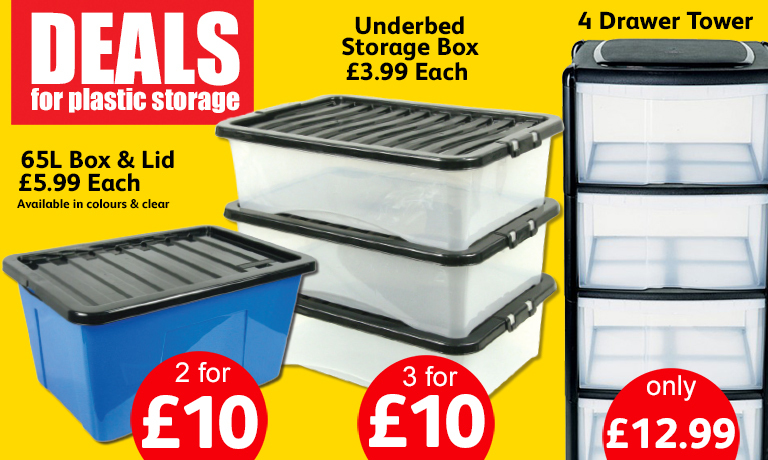 Underbed Storage Box - 3 for £10. 4 Drawer Tower - £12.99.